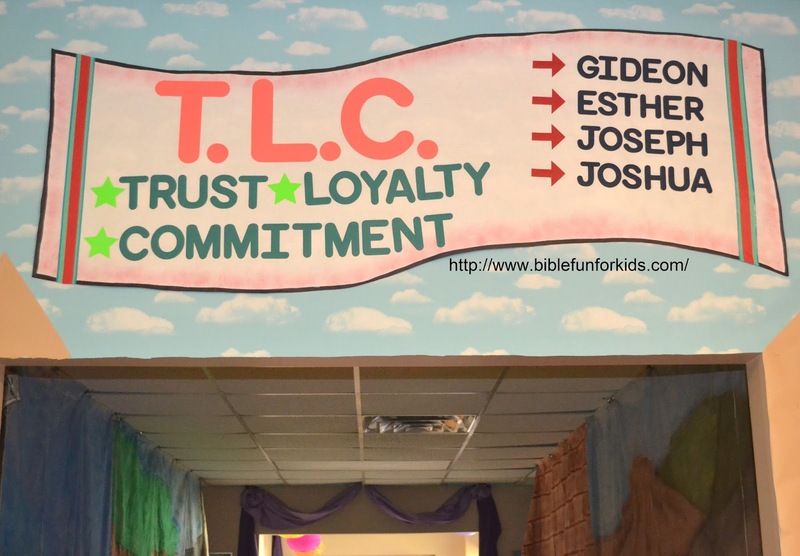 For this year's VBS, we are creating our own (year 2 of a 6 year rotation) and called it TLC: Trust, Loyalty, Commitment. We are studying these Old Testament people: Gideon, Esther, Joseph and Joshua. I created these large banners from white bulletin board paper. They are abou 6' long. I used my Cricut machine to cut the letters and ink pads to add the texture around the edges. I used Duct tape and color Masking tape for the stripes. The tapes are a HUGE time saver. 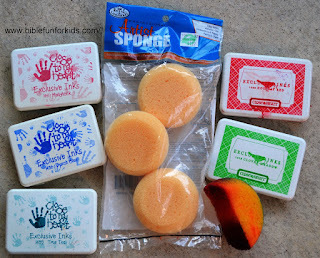 It adds color and texture and is so easy to use and there are so many colors and designs available. You can see more about the banners at the end of the post. 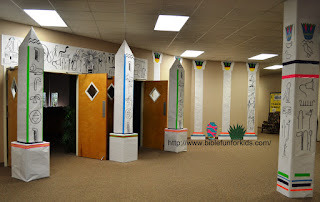 I am sorry to say that we were asked to plan the decorations 10 days before VBS this year. So, with a week to plan, create, gather supplies, draw everything out, paint, etc and put it up, we were limited to what could be done. There wasn't time to order anything, so even paper had to be in stock at our local teacher's supply store. 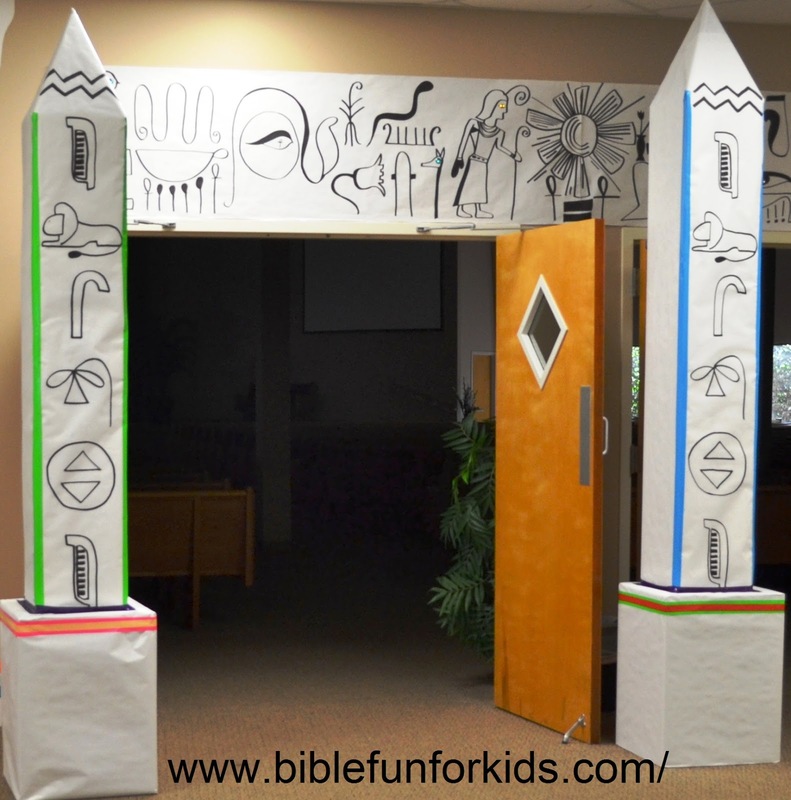 I decided to decorate with the Egyptian theme, because I love it and because it was pretty easy and colorful for the kids. I wanted to make a nice Egyptian cute stand-out box frame around the doors, but didn't think there would be enough time. So, I decided to make a border on the wall around the door. But, because of how the doors open, you couldn't see the sides anyway, we decided to just do above the doors. We added the door side frames that didn't get used as the two end colums for added pop. Kelly drew the hieroglyphics and then added some jewels here and there and it looks great! 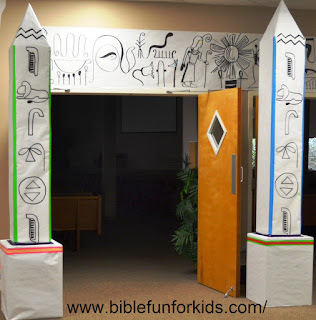 We carried the hieroglyphics theme around the support pole (far right) and on the obelisks. I found the hieroglyphics alphabet online, and the obelisks say 'WELCOME'. We purchased these boxes for the base (one for each) of the obelisks, and purchased these lamp boxes for the tops (our ceiling height took 2 boxes each). My husband cut 10" down from one end of the box just enough so it could be bent. Then, cut each of those sections to look like triangles. We also used this box for the base. We used clear packing tape to join them, cover with bulletin board paper, and decorate. I purchased these great colored tapes (at Wal Mart in the paint dept. and craft dept.) and we used it to tape both finished sections together and to add color and decoration. It creates nice, straight, colorful lines. Did I mention I LOVE these? I designed the top and bottom of the columns to fit on one piece of poster board. These are what I actually purchased the decorative tapes for! I was trying to think what could be used instead of painting all of them and making perfect straight lines. I had some of these tapes, but found all the perfect bright colors! Yah! I cut them a little long so they could be folded to the backs of each piece. 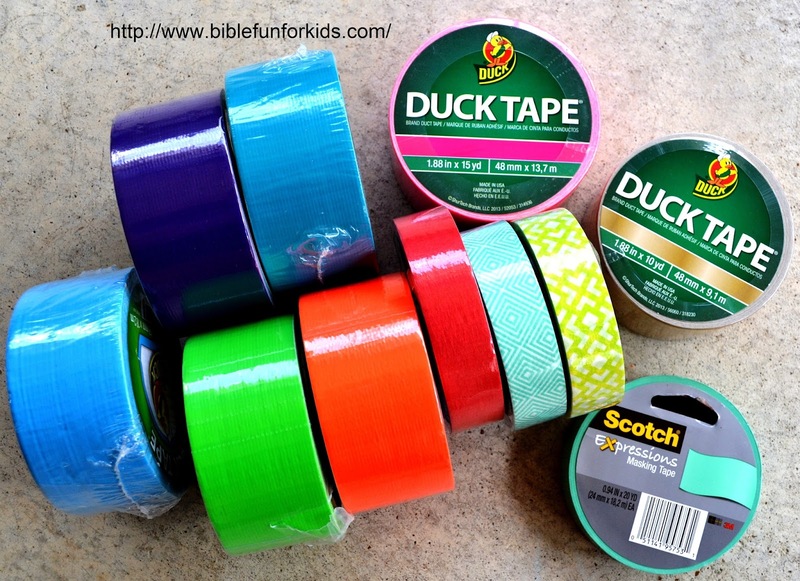 I layered different tapes together to create different styles. The bottoms are a 22"x6" base rectangle with a 15.5"x4" rectangle on top of that in the center. I cut them out and added the decorative tapes. For the top of the columns, I designed a basic shape that I wanted, then added the Lotus design. After painting them, I added the tape for accent. Again, I didn't have to worry about straight lines using the tape. Theresa cut the white bulletin board paper into 12" strips to complete the columns once both parts were on the wall. 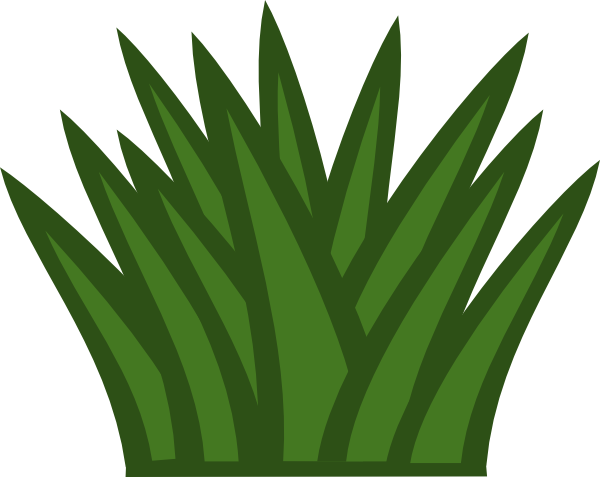 You can find the plant graphic here. The different graphics for the pots are here. I drew them onto bulletin board paper and the kids used the Duct/Masking tapes and jewels to decorate them. For quick and easy, I purchased the cloud bulletin board paper and Carter stapled that on the other walls for the sky. 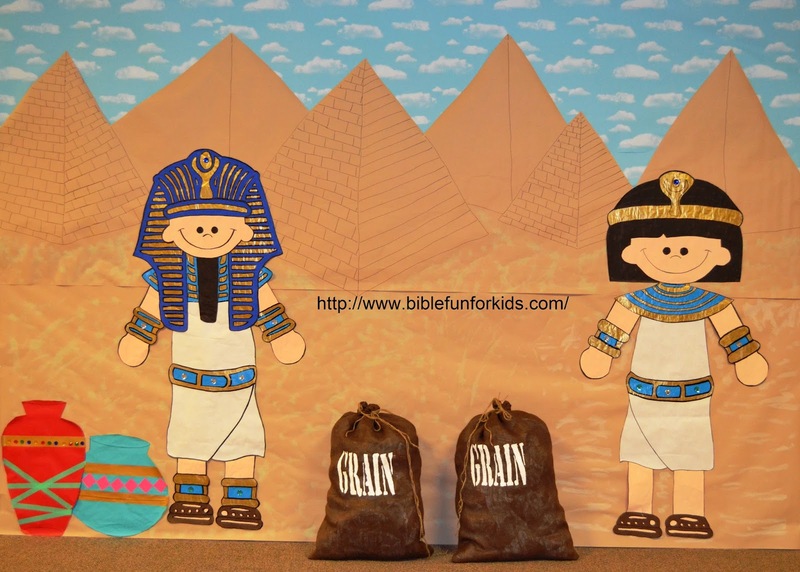 I used a natural bulletin board paper along the bottom and Emma created the pyramids to finish the rest of the walls. Our kids used a sand color paint and sponge to add the texture to make the paper look like sand. 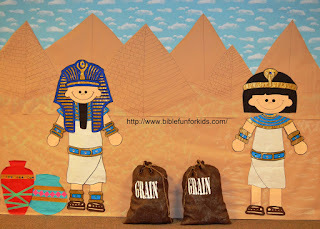 For this wall, I painted Pharaoh and Joseph about 6' high (you can purchase the graphics here). I added jewels on their belts, headpieces and leg cuffs for a shiny pop. I purchased the burlap to make the bags for the grain. I used one yard per bag of burlap. If you can cut and sew outside… that is a good choice. If not, expect to clean up a mess. My kitchen looked like I hadn't cleaned the floor. Ever. It makes a mess. Anyway, I double folded the seams so it couldn't fray and sewed it with a zigzag stitch twice along the one open side and the bottom. (I used the folded edge and a side.) For the top, I double folded over the edge and zigzag sewed it twice. I printed this stencil onto cardstock and used this white paint. Tuck the stencil inside the bag under the front. Lay it flat and use your fabric paint to add the 'GRAIN' logo. Let it dry, this paint took 4 hours, so once it was tacky, I pulled out the stencil before the paint was all set. I filled the bags with crumbled newspapers and used Jute string to tie around the top and close the bags. This wall is behind the registration desk, so it needed to be high so it could be seen. 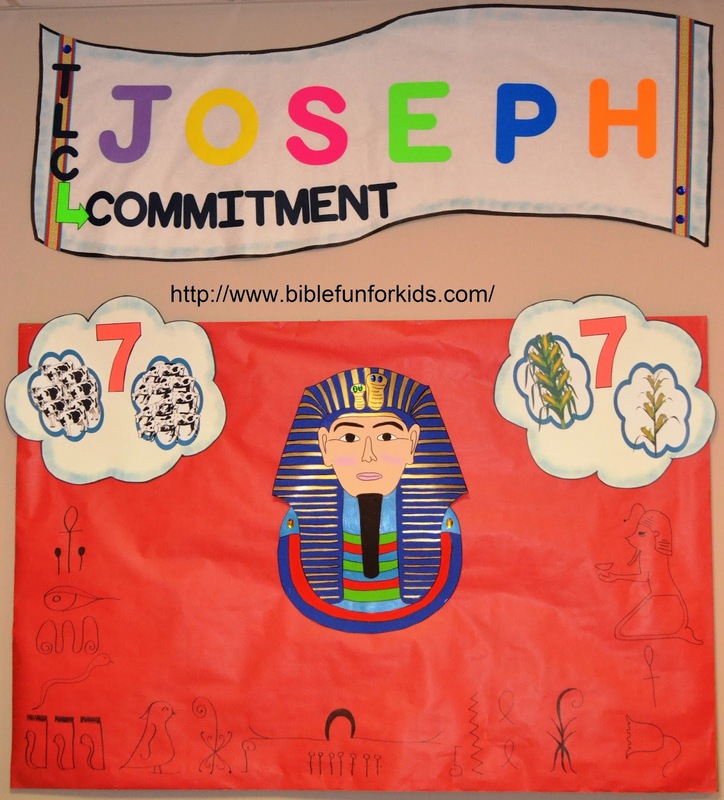 I added the JOSEPH banner and used different color cardstock because of his coat of many colors. I drew the banners onto about a 5-6' sheet of white bulletin board paper using this basic pattern here. This is a Word DOC so you can change the names and info. I used my Cricut Learning Letters to cut 10" names for all the banners. Print the dream bubbles here. I used ink pads and a sponge to add the color edges. I used the Duct/Masking Tapes to decorate the sides on all the banners. I used this graphic for the Dream Clouds. You can download the dreams here and I just added the seven for the years. I used the Pharaoh graphic here. I added some jewels to create a nice shiny pop for the kids. And, Kelly added more hieroglyphics along the bottom to finish it. I couldn't get a good picture of Esther because the hall is too narrow. Lindsey painted Esther and Aiden painted the king. We used purple plastic table cloths for the curtains and some party ceiling decorations for some color and pop. The younger kids had too much fun using the Duct tape to decorate the pots on our workday. On the opposite wall is all windows and we set up a table to look like a feast to complete Esther. Because of limited time, I didn't know if Joshua and Gideon would be able to go up. 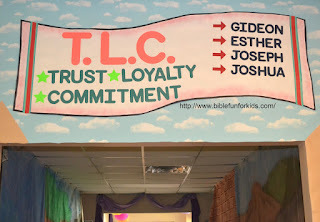 I made these 6' banners to match the others and planned to just add Gideon. Since some people took these home to paint, we were able to do these walls. We put up the navy blue for the background since he fought at night. Sarah painted Gideon for us. People cut out a moon and lots of stars to finish this wall. This Joshua wall is opposite of Gideon. The 6' banner follows the same as the others. Chase took home Joshua to paint for the wall. We put up the green paper for the background. I wanted something light and bright since Gideon is dark. This was the best photo I could get because of the narrow hallway. Someone (sorry, I don't know who to give credit to) drew Jericho falling down on gray paper and mountains on brown. Intro graphics by Ashley Hughes.